Sam and her best friend Melody live in the colourful beachside town of Squeaky. Sam’s mum Kate runs the Conch Café, the bustling meeting place for Squeaky’s weird and wonderful collection of residents. There’s Bob Rampol, the friendly senior citizen who watches the world from his favourite spot on the café’s balcony, waiter Manuel Alphonso Demetrious, world famous opera singer Mrs Canzone, and the Affington brothers - muscle bound twins who run the local fitness centre. But all is not well in Squeaky. Mrs Canzone’s lost her voice, the twins’ fitness centre is failing as client after client suffers sprains, strains and breaks. Manuel, (or Manny) has burned his arm so badly he can’t work in the café, and Kate is struggling to keep the place running on her own. When the café burns to the ground, Sam and Melody are forced into action - armed only with a rudimentary understanding of Tae Kwan Do and a mysterious monitor given to them by magician, The Great Franco, the girls venture into strange virtual worlds where they meet Hecate, and confront evil head on. 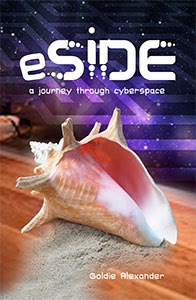 eSide is a tale of witchery and digital adventure told with quirky humour. Goldie Alexander’s story is dense, with scenes and detail lovingly rendered in a unique voice. Mid to upper primary readers will enjoy the novel’s cast of crazy, nasty, nutty and nice characters, and intricately imagined virtual worlds.